Rassie Erasmus, SA Rugby’s Director of Rugby, Springbok captain Siya Kolisi and 2018 Player of the Year Pieter-Steph du Toit took time out of their busy schedules on Thursday to inspire the SA Rugby Academy squad as they approached the end of week one of the 2019 programme. Erasmus, Kolisi and Du Toit were joined by Eben Etzebeth, Damian de Allende, Damian Willemse, Sikhumbuzo Notshe, Steven Kitshoff and the Springbok assistant coaches, who encouraged the players to work hard and to make the most of the opportunity to work with Junior Springbok coach Chean Roux and his coaching staff, while also focussing on their studies. The SA Rugby Academy Programme, which was launched in 2015, aims to balance formal education with high performance training and player welfare. Thanks to the vital support from various corporate donors through the Rugby Education Foundation (REF) and sponsors such as Remgro (through the Stellenbosch Academy of Sport) and SuperSport, more than 120 players have received education bursaries to date. The 2019 programme kicked off on Monday and will run until 20 April at the Stellenbosch Academy of Sport. 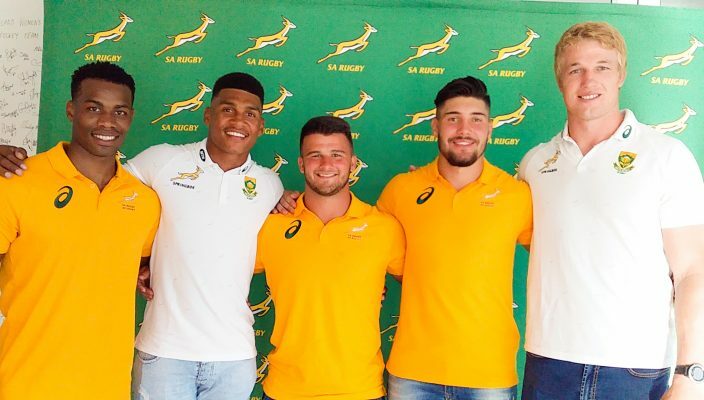 “The SA Rugby Academy programme is a very important, not just in terms of the development of our top junior players on the field, but also off the field through the education bursaries they receive,” said Erasmus. “The focus is very much on the holistic development of the players”. “There are a few lessons we took from last year that we will use to improve the programme this year, and we are excited to see these players flourish in the next few months”. With the World Rugby U20 Championship being hosted in Argentina in June, Erasmus was confident that a number of players would feature in the international spectacle, and looking further ahead he hoped to see some of the players run out for the Springboks in a few years. “Not every player will make it to the Springbok team one day, but this is a golden opportunity for these players to develop on and off the field,” Erasmus said. “The luxury of this programme is that even if some of the players don’t become top rugby players, they have the opportunity to grow as people and hopefully one day contribute to society. The SA Rugby Academy forwards received an extra treat yesterday, as Springbok forwards coach Matt Proudfoot was hands-on in their scrummaging session earlier in the day.